Shirley is, in my opinion, one of the more under-appreciated characters on Community. Like I've said in past reviews, I personally do not have a least favorite character, but I do have a favorite character in Annie Edison (in general, because from week to week, this can vary). But I feel like a lot of people wildly underestimate how wonderful Shirley can be as a character. And truly, as a character that learns and grows, she is right on par with Jeff. Because as we know, Shirley is selfish just as Jeff Winger is. The difference is that Shirley's selfishness manifests itself in the desire for protection and safety and comfort. The reason that she cares so much in this episode about everyone attending her party is that she believes surrounding herself with people will somehow allow her life to make more sense, or at least give her the comfort of some sort of stability. While Jeff's motives for his selfishness often are more outright manipulative, Shirley's are masked a bit behind her sweet-natured attitude. That doesn't mean, however, that either Shirley or Jeff are terrible human beings. Both of them truly learn from the other by the end of the episode, and that's why I really enjoy "Comparative Religion" - it's a great episode for their development as characters together. And arguably this is the first time they really do have a heart-to-heart storyline, even though they have had a plot together in the past. This is the hinge story for the Jeff/Shirley friendship because it's an episode where they both come to grips with how fundamentally different they are in terms of beliefs and attitudes, but they both form a mutual respect for one another by the episode's end. Shirley learns that family means supporting and loving, even though you may disagree. And Jeff learns that sometimes love drives people to do crazy things, but that doesn't make them crazy. It also doesn't make him care about them any less. In case you need a refresher on the plot of this episode, here goes: It's finals week at Greendale, which means that Jeff is desperately trying to cram for Spanish because in between all of the shenanigans the first half of the season, Jeff has still yet to learn how to study properly. Shirley, we learn, is planning a Christmas party for everyone after they finish their final exams and is decorating the study room accordingly. She also gives each of the members a "WWBJD?" bracelet, which she informs them stands for "What Would Baby Jesus Do?" so that they are reminded of the true meaning of the holiday season - Christmas (meanwhile, the Dean is hilariously trying to be as unoffensive as possible and insists on proclaiming "Merry Happy!" to everyone, while in a non-denominational Mister Winter outfit). Abed gets harassed by a bully named Mike while trying to get cookies for his friends in the cafeteria, which leads to Jeff standing up for his friend and agreeing to fight the bully. But we'll get to that momentarily. This episode is a stand-out for Yvette Nicole Brown, in my opinion. There have been a few episodes and scenes that she's really stolen, and this episode is definitely one. I love that "Comparative Religion" sees Shirley at her most vulnerable, while not expressing it in a heartbreaking way. When I discussed "Introduction to Statistics," I noted that the conversation between Britta and Shirley in Slater's office is poignant. It causes the viewers to really empathize with Shirley. We want to reach out and hug her because she's supposed to be the victor in her divorce. Even though her husband cheated on her and left her, we - again, as audience members - want the underdog to always overcome. That's why shows like "Glee" first appealed to the masses. Within each of us is this desire to see the underdog win, and to have a pleasant bow wrapped on the end of each episode. "Comparative Religion" doesn't focus on the heartbreaking aspect of Shirley's growth as a character, since we have already had a dose of that a few episode ago. Instead, we focus on what love can cause a character to do. But let's also momentarily discuss Jeff in this episode. And Jeff is always a fun character to dissect because - whether he likes it or not - he's always learning something. We haven't really seen Jeff become protective too much throughout the season. Usually he's the try-to-act-cool-and-not-care type. This is the guy who seeks to benefit himself first and foremost (most of the time, but more on that later on), and yet defends Abed against the school bully. And he's the only person who actually stands up from the table to go over and protect him, which is a turn-around from the pilot where Jeff merely used and abused Abed in order to gain what he wanted. Slowly, but surely, Jeff is growing to love and respect his adorable gang of rag-tag misfits, and he goes out of his way to protect Abed. He also steps forward when Mike moves toward Abed, which is a nice physical manifestation of what I mentioned earlier. The first scene in the study room marks the point in which Shirley's "perfect" college family image begins to crack. When the woman asks if everyone is going to go home to change into their Christmas attire before her party, the group guiltily looks around at one another, before declaring that they are all of different religious backgrounds. It's at this point that Shirley's faith (pardon the pun) in the stability of this aspect of her life begins to crumble. And I'd bet that this is how Shirley's real family issues spiraled as well - most of the hardest moments in life don't start out as waterfalls, but tiny cracks (a prick of pain here, or a little jab there) which grown and soon spiral into something we can no longer control. And control is a big deal to Shirley, because she's frustrated and devastated by the lack of it in her real family. But the irony is that in trying to control something, you often lose control and everything you have built up because of it. The study room moment is a "tiny crack" moment for Shirley. At this point, she's clinging to every piece that she can (perking up when Pierce mentions being "born again," trying to confirm that Jehovah's Witness is a type of Christian, etc. ), but she'll hit the waterfall moment soon. It's finally time to take the Spanish exam, and Mike interrupts in order to pick a fight with Jeff (only because Jeff snarked a remark at him). And here's also the funny thing about Jeff in this episode - every time we see Jeff progress in some way, shape, or form as a character, we are also reminded that he is human. There are lengths that Jeff will go to in order to help out his fellow friends. But there are also lengths he's not willing to go to unless there's also something in it for him. If you recall from last week's blog-review, I mentioned the "selflessly selfish" concept. Take note of the reason(s) he gives Shirley later on for fighting Mike. And yes, notice that there are two. By the end of the scene, Jeff agrees to fight Mike at 3 PM that afternoon. Since Jeff has never been in a fight, Pierce, Troy, and Abed agree to help prepare Jeff for it. Meanwhile, in the study room, Shirley (oblivious for the moment that Jeff agreed to fight someone on her special day) and Annie are preparing the decorations for the Christmas party. And I wondered why Annie, out of the entire group, is most offended by Shirley's behavior (she's the only one who leaves for Jeff's fight looking disgusted at Shirley's behavior). There's this scene between them in the study room (where Shirley has begun her slow descent into love-and-control-induced Christmas insanity), and Annie looks quite upset with the woman. After pondering it, I think that it's perhaps because Shirley is supposed to be wiser than Annie is, and the younger woman looks up to her. And indeed, Annie looks up to both Shirley and Britta for different reasons. She admires the independence and "cool"-ness of Britta. With Shirley, I think there was always more of a respect there, and perhaps this episode just shifted her perspective of Shirley slightly, and it probably unsettled Annie to feel that way. Shirley (informed by Annie) discovers that Jeff is preparing to fight the bully before her Christmas party. And see, to Shirley, December 10th is so important because it represents Christmas, not because it IS Christmas. It embodies the time of year where she is supposed to be surrounded by people who love her and with whom she can celebrate. And instead, this year is a year that is very much upsetting to her. It's not the defamation of Christmas by political correctness, or religious differences (though that does upset her) - it's the defamation of what it represents. But see, Jeff doesn't understand that. Jeff only sees the surface issues sometimes with the study group. He's focused on doing something because HE wants to do it and because somehow it will make HIM feel better. He never does ask Shirley why the day is so important to her - he just dismisses her insistence by noting that it's only the 10th of December, after all (while the rest of the study group has the good sense to actually look guilty during this). Remember what I said earlier, though? About the reasons Jeff gives for fighting Mike? Here are his two reasons: "Because he picked on Abed and because he corrected my Spanish." Recall, once more, that Jeff is a selfish character and that he wants to do things that benefit others, while somehow also benefiting himself. He agreed to recruit Troy to play football in order to avoid being blackmailed; he joined the debate team to get a parking spot; he confronted Chang to have a shot at passing Spanish, etc. Shirley and the group meet up in the study room for the party, and when Jeff doesn't show up because he has decided to fight Mike, Shirley banishes him and informs that anyone else who wants to go to Jeff's fight (if they do so) will be dead to her. Shirley loves her study group so much that she tries to glue them together into a vacant puzzle board in the sincere belief that when she is finished, they'll look exactly how she wants them to. But what she doesn't realize is what a lot of children don't realize when they attempt puzzles - you can't make a piece fit into a puzzle if it wasn't intended to. In fact, if you try to jam a piece of a puzzle into a board that doesn't belong, you end up both frustrated and damaging the piece. Instead of (initially, because by the end of the episode she learns this) accepting people for how they are (flaws and all), Shirley desires to "fix" them into the images she wants to see. And this is understandable because she wants to do the same with her real family. Britta identifies that Shirley wants to hard to recreate something she's afraid has been lost. But instead of walking through the hallways of McKinley High School belting "What I Did for Love," and probably learning very little, Shirley comes to accept that when the pieces of the puzzle don't fit, it's not that you've done something wrong - it's probably that the picture you're making is different than the one you anticipated. As @RobZuber mentioned on Twitter (and practically read my mind!) the breakdown scene in the study room exemplifies that Britta still considers the group to be hers. With Jeff out of the picture (momentarily), she takes charge and provides insight into what should be done. She gives what we will come to know as the "Winger speech" and does a great job at pointing out what Jeff had failed to - the root cause for Shirley's actions. Jeff didn't take the time to understand WHY Shirley acted the way that she did but Britta (season 1's soft Britta) did. See, you can't fix a problem until you can identify the actual cause of the problem. Shirley's behavior wouldn't be altered until she realized what she was doing and why she was doing it. (This is also a perfect example of how Britta didn't "Britta" anything up and really would make a great therapist). Jeff may not have learned the root cause behind why Shirley acted the way that she did, but that didn't stop him from learning something about himself and her in the process. He looks at the bracelet right before he is about to fight Mike and realizes that sometimes, not everything is about him - he takes special care to place his glasses, watch, phone, etc. out of harm's way and wants his face to remain un-touched by fists. But it's wonderful that he also recognizes that the season of Christmas - whether he agrees with it or not - means something to someone he cares about, and that warrants respect. And at that moment, Shirley realizes too that though her college-family may be different than her real one in the sense that they all have different morals and beliefs, Jeff truly does care and that warrants HER respect of HIM. 'tis a beautiful full circle, no? 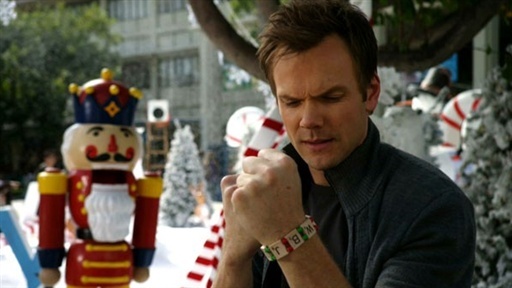 The entire study group bands together to fight Mike and his cronies, and the whole sequence is just fantastic, especially when fake reindeer and giant candy canes are involved. By the end of the episode, everyone exhibits varying degrees of sustained injury. Chang interrupts the group right after Shirley has completed an unoffensive holiday song (and Yvette's voice is beautiful, so she should sing on the show every chance she gets! ), to announce that the final grades have been implemented and that everyone will be moving on next semester... except Jeff. There's this moment of terror on Jeff's face when Chang tells him that he wouldn't be moving on with the study group. And normally, I'd attribute it to something like Jeff being horrified that his four-year plan is de-railed, etc. But I honestly think that because of this episode and the progress he made as a character, he was frightened by the thought that he could be separated from a group that he had just begun to care about. His fear and dejection are palpable, but short-lived because Chang then announces that Jeff is moving on too (he just wanted to psych everyone out). The episode ends with a celebration of friends, a new "family" and another semester of Spanish! - Anyone notice that our favorite bully was in the background at the beginning of the episode? - "I'm... gonna put that in the pocket closest to my heart." - Yvette's guilt-voice is perfection. - Annie and Troy not knowing who Billy Joel is depresses me. Perhaps because my dad introduced me to soft rock 'n' roll growing up. - "That guy wasn't gay! He had a mustache." - "Because doing more than the minimum work is my definition of... failing." - I love that Annie throws a paper ball twice at Jeff during the study room scene. - "Senor Chang, can you do something about this?" "...I'll allow it." - "You've never been in a fight?" "Technically no. I guess I'm too charming and likeable. Call me a name." "... I can't." - "You know, in boxing you fight for the purse and the belt." "I've gotta write a paper about that!" Honestly, I have said this about so many things before. Britta, I adore you. - "We're trying to get Jeff ready for the fiiiiiiiiii...ght. I couldn't think of another word." "Idiot. He meant we were fi...ghting. It IS hard to think of another word." - "Are you perpetually on your way to the gym?" - "Come on, I'm being punk'd, right?" - The tag will always be golden. All right folks, next week I will be taking the week off. Since my birthday is on Thursday, I have a friend coming into town for the weekend and will be spending time with her (which I am excited about!). In celebration, however, you should all make time between Thursday and Friday to watch ANY episode of "Community" you choose!